When was the last time you had your team wipe out everything in their sales pipeline? You’re thinking I’m crazy, but give my strategy a read before passing judgement. 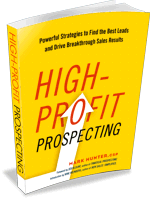 Salespeople are no different than anyone else and that makes us all creatures of habit. When it comes to sales pipelines, it means we as salespeople will always work what is in our pipeline, even if it means spending time with prospects who are not worthy of our time. We have to continually put new leads into our pipeline and at the same time take out leads and prospects who are not worth our time. Big fat sales pipelines are not healthy. What is healthy is a fast moving pipeline not plugged with bad prospects. The most valuable resource you have is time. It’s the only resource that is truly finite. Let’s spend that finite resource on the prospects who we can turn into customers, not those plugging our pipeline.